Bahria University Medical & Dental College Karachi Sindh. 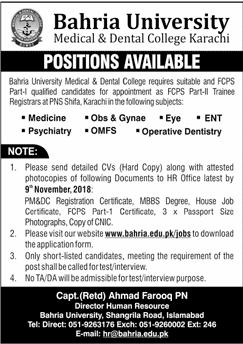 Bahria University Medical & Dental College requires suitable and FCPS Part-I qualified candidates for the appointment as FCPS Part-II Trainee Registrar at PNS Shifa Karachi in the following Subjects. Please send detailed CVs (Hard Copy) along with attested photocopies of following documents to HR Office latest by November 09, 2018. Please visit our website www.bahria.edu.pk/jobs to download the application form. Only shortlisted candidates, meeting the requirements of the post shall be called for test/interview. No TA/DA will be admissible for test/interview purpose.